As Christmas approaches, our 10 point checklist points out the obvious and not so obvious perils in the home for your parrot! Christmas is a great time for families and friends, but it can be a hazardous time for parrots if you don’t plan ahead. Get a quote to insure your parrot for up to £5,000 of vet fees, death and theft. So what risks at home should you look out for with the festivities approaching? Are Christmas trees safe for birds? Parrots love trees, after all, it’s where many of their ancestors originate from. However, it’s not a good idea to let your parrot hang around the Christmas tree. Not only could the tree topple over, but she may be tempted to nibble on it, resulting in potential choking. Pine and spruce branches are considered safe however, be aware that if the tree has been sprayed with an insecticide or a preserving agent it could be toxic. Also, be aware that any sap produced by the tree could stick to your parrots feathers. These are generally safe for your parrot, however you should be aware that your parrot might try to eat the fake needles. This could cause her to choke, or for the needles to get stuck in her insides. If you have baubles and lights hanging on your tree, or ornaments around the house, be very careful. Your parrot may see them as a new shiny toy, and try to play with them! This could lead to her getting hurt if the item breaks. Or even worse, electrocuted. Also, any loose string or cable could also get caught around her leading to injury. Don’t forget that at ExoticDirect we offer parrot insurance for accidental injury, illness, mortality and theft! So if your cheeky parrot does get herself into a scrape, it needn’t cost you the earth. 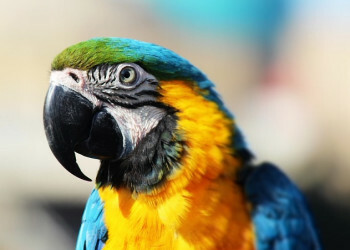 Room fragrances should generally be avoided as they can affect your parrot’s very sensitive respiratory system Some parrot owners have reported issues where their parrot has suffered with breathing difficulties simply because a plug in air freshener has been installed. The same should be said for candles. When burnt, candles can release toxic fumes and these could pose a threat to your parrot. Beeswax candles are thought to be the safest for your parrot, however, if in doubt, don’t use any. The noise and hub-ub of having lots of new and exciting visitors in her home, could lead to your parrot becoming distressed. Birds like stability and routine, and a sudden upset in this could lead to feather plucking or screaming. Bear these things in mind, and try to give your parrot extra attention, should your house be extra busy. If your parrot does begin to exhibit signs of stress, speak to your vet about what you should do. When you’ve got visitors coming and going the open door is an invitation for your parrot. Keen to explore, she could see the open space as the start of new adventure. However, we know that it isn’t. Make sure your parrot is safely away from the door when visitors arrive or leave, and that any open windows are covered with blinds or mesh. Don’t forget that your back door also poses a threat, so bear this in mind. Whether you’re popping to the bins, tidying the garden, or ventilating the house, your parrot may still head out when your back’s turned. 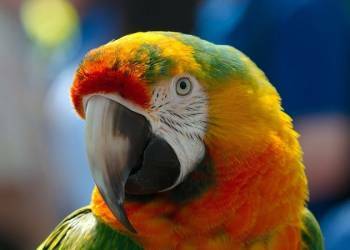 You may like to read this Keeping your parrot safe - security and identification. We love to leave bits and pieces of delicious food around the house during the seasonal period. And as much as we love our nibbles, so will your parrot. Our food isn’t that great though for your parrot. Nuts can present a choking hazard, and are often loaded with salt, and many foods can be harmful. (To find out which foods your parrot can eat check out our articles What your parrot can eat, diet and food ideas and Safe food and plants list. Your parrot would even try your alcoholic drink if you leave it lying around, so make sure she can’t get at it. The last thing you want is an intoxicated parrot, and a possible vet visit over Christmas. With all the excitement of preparing a seasonal meal, make sure your parrot doesn’t try to ‘lend a claw’. 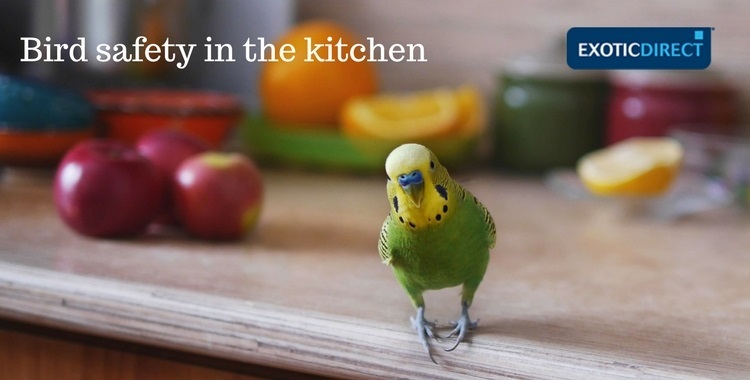 Keep your parrot away from those boiling pans and hot oven trays as you prepare your festive treats. Their curiosity can get them into trouble, and could end up with a nasty scald or burn. It goes without saying that it’ll be more than the food that will suffer if you burn your non-stick pans or oven trays. Burnt Polytetrafluorethylene (or Teflon, to go by its most popular brand name) releases dangerous toxins into the air that can kill a parrot almost instantly. We can’t emphasise enough the importance of not burning Teflon, and the impact it’ll have on your parrot. Don’t use non-stick pans if you can help it, and if you do need to use them, keep your bird well away from the kitchen when you’re cooking. Fumes can travel to other rooms, so keeping your parrot elsewhere isn’t always going to be deterrent. If your bird isn’t used to loud music or noisy people, this could upset her. If playing loud music, try keeping it to an area she’s not in, so that it doesn’t affect her as much. Visitors may also not be as conscious of your parrot’s safety as you are, which could also lead to accidental injuries for her. If you decide to have fireworks, make sure that you close the curtains and shut any windows before setting them off. Playing your parrots favourite tv or radio show can also help, acting as a distraction. Check out our article on fireworks and pets. Do you know it’s estimated that there around 700,000 birds being kept as indoor pets in 2017? Research conducted by the Pet Food Manufacturer Association reveals that this figure has increased in recent years, along with pet ownership of other types of pets. We really are a nation of animal lovers! 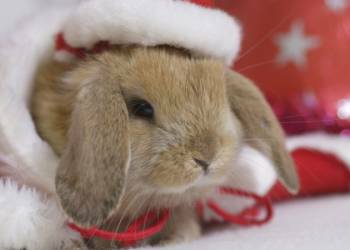 Christmas is a time for giving - but is it a time for giving pets? Security advice for your bird - wing-clipping, ringing, and micro-chipping.